Pakistani lawmakers elected a nominee from Prime Minister Imran Khan’s party to the ceremonial office of president on Tuesday, further cementing its hold on power. Arif Alvi will replace President Mamnoon Hussain, who completes his five-year term on Sept. 9. Pakistan’s elections oversight body will certify the result Wednesday. The president is elected by lawmakers from the National Assembly, the Senate and four provincial assemblies. Alvi, a senior member of Khan’s party from the southern Sindh province, faced little challenge from Aitzaz Ahsan, from the opposition Pakistan People’s Party, and Maulana Fazlur Rehman, a pro-Taliban, anti-U.S. radical Islamist. The opposition failed to unify behind a single candidate. Tuesday’s election came two weeks after Khan, a former cricket star and longtime politician, was elected prime minister. His Tehreek-e-Insaf party won the most seats in July’s national elections and joined with independents to form a government. 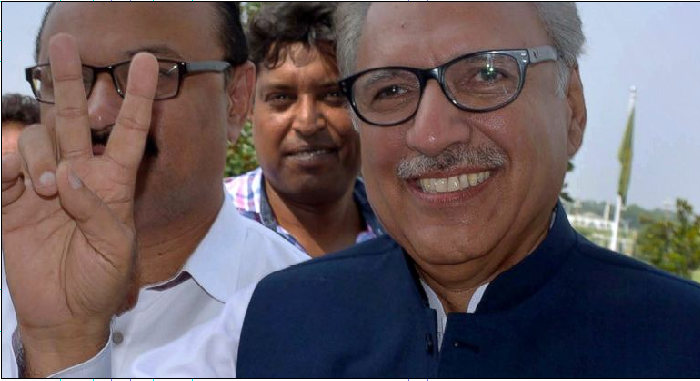 Alvi won 212 votes in the upper and lower houses of parliament, while Ahsan got 81 and Rehman secured 131, according to the Election Commission. Alvi also got the most votes in the four provincial legislatures.